The largest real estate transaction for individual property in Latvia last year took place when Ilya Gerchikov, CEO of local Dzintars cosmetics company, sold his villa in the wealthy resort town of Jurmala for 3.9 million euros to the family of billionaire Alisher Usmanov. Forbes has named Usmanov the richest person in Russia. He spends time between Moscow and London where he owns a number of expensive properties (as well as a stake in the football club Arsenal). Re:Baltica parners in investigation, TV3 program Nothing Personal, claimed that none of Us-manov’s family members have applied for Latvia’s residence permits. Usmanov’s wife’s son, Natan (Anton) Viner, who is real estate developer in Russia and in whose name the property at Kāpu iela 51 has been registered, did not respond to questions. Well-known satirist Mihail Zadornov has added to his portfolio of real estate an apartment in one of the postcard buildings of Riga’s art-noveau, Alberta street. According to data from Latvia’s Land Register, he purchased it from SIA I.M. Centrs for approximately 458,000 euros. Shortly afterwards, Zadornov, who has a Latvian residence permit, angered a number of local parliamentarians with an article which they perceived to contain incitement to hatred. They invited the Interior Minister to consider the annulment of his permit, but he did not see the grounds for it. 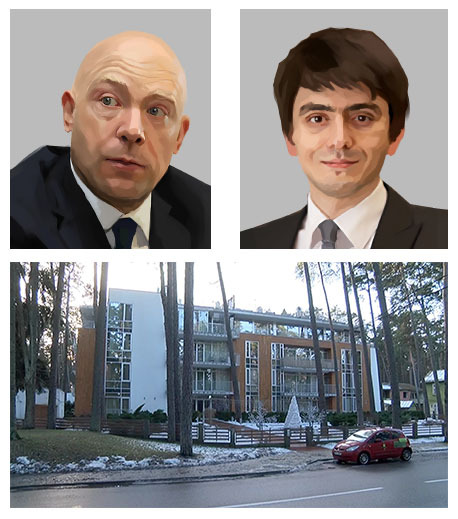 A number of board members from the state controlled telecommunications company, Transtelekom, CEO Artem Kudryavcev and Vice-President Shukhrat Ibragimov, purchased an apartment worth 700,000 euros in Jūrmala at Dzintaru prospekts, with two other people, and obtained residence permits. Transtelekom is a subsidiary of the state giant Russian Railways. It is among the five leading Russian communications companies, claims the company’s website. They did not wish to respond to questions from Re:Baltica. One of the first people to receive a residence permit under Latvia’s investor program was anoth-er close ally of Putin, billionaire Arkady Rotenberg, who has now been sanctioned by the US and the EU. His permit was valid from 2010 to 2013 when he did not ask for it to be renewed. The permit was obtained not through the purchase of real estate, but in the least transparent way: by making a bank deposit. Up until the introduction of the sanctions, the Rotenbergs owned the SMP Bank in Latvia. 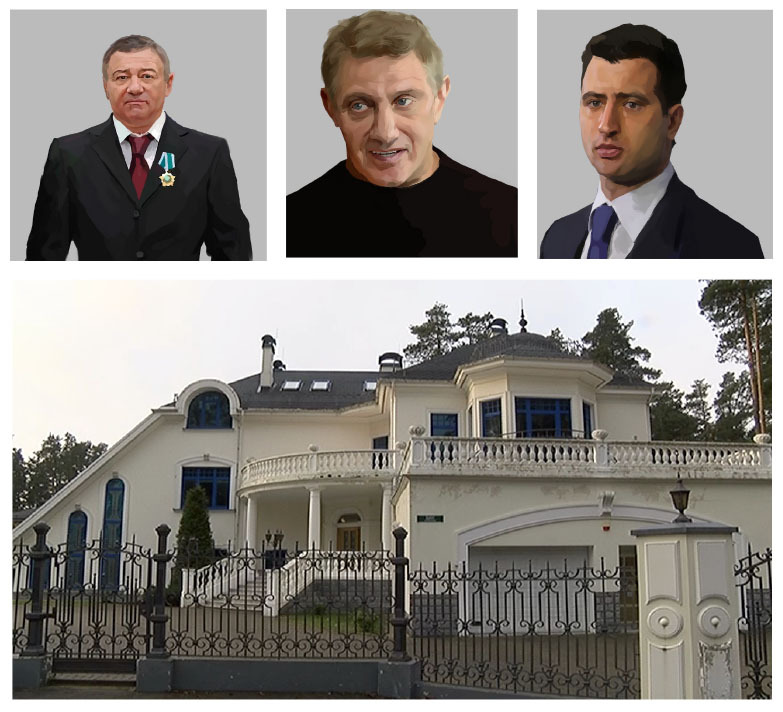 The other brother – Boris Rotenberg – had acquired a property at Garkalne, via shares in the company which owns the property. He has Finnish citizenship and has not requested Latvia’s residence permit. After the US and EU sanctions were introduced, he transferred his shares in the company to his son Roman Rotenberg, who is the vice-president of Gazprombank and the vice-president of SKA Hockey Club in August, 2014. 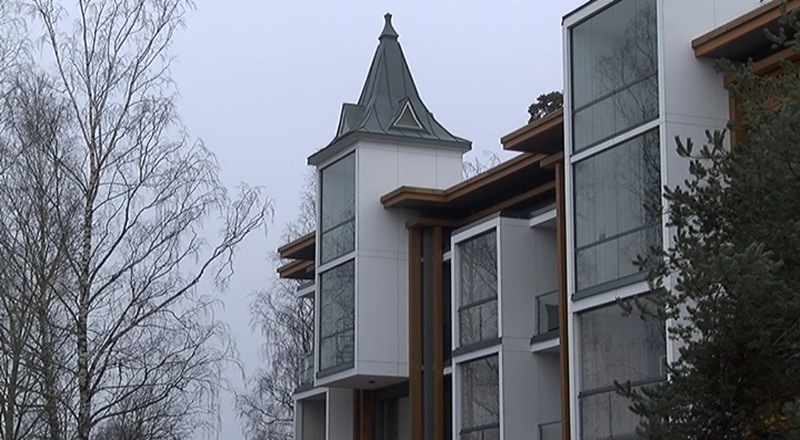 A popular residence among permit holders is another house in Jurmala, Kāpu street. Nikolai Korenev, another member of Gazprombank leadership (Deputy Chairmаn of the Management Board) purchased an apartment for 275,000 euros and obtained a Latvian residence permit in 2014. Prior to Gazprombank, he’d worked in the state bureaucracy, and since 2004 in a bank currently holding similar positions in Areximbank in Armenia and Belgazprombank in Belarus, which are affiliated with Gazprombank. Gazprombank, the third largest bank in Russia, is controlled by the national energy giant Gaz-prom and it’s pension fund. 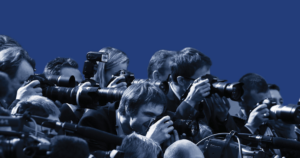 Gazprom-Media Holding, a subsidiary of Gazprom, holds control of media enterprise which encompass NTV, radio Eho Moskvi and the Izvestija newspaper, among others. The bank is under EU and US sanctions which were introduced after the annexation of Crimea and Russia’s support for the pro-Russian fighters in Ukraine. “As Gazprombank is not a state company, this theme is not important to us,” Re:Baltica was informed by the press office. Korenev has a number of Ukrainian businessmen’s families as neighbours, including Ganna Pushkarova, whose husband Vadim Pushkarov was, for many years, the President of another bank under EU and US sanctions, VTB, in Ukraine. The majority of the bank is owned by the Russian state. In 2013, he stepped down from this position and later contested Ukraine’s parlia-mentary elections as a candidate from Sergey Tigipko’s party list, Strong Ukraine, but did not get elected. Both men are linked by previous business dealings. Pushkarova has a residence permit. She refused to comment. The Sky Garden residential complex in Jūrmala is another property valued by residence permits holders. Natalia Konovalova, who until last November was the Vice-President of the Bank of Moscow (also under EU and US sanctions as the subsidiary of VTB), purchased an apartment and got a residence permit. According to data from the Land Register, her apartment in the complex cost 290,000 euros. She left Bank of Moscow last November for a small private bank, and could not be reached for comment. 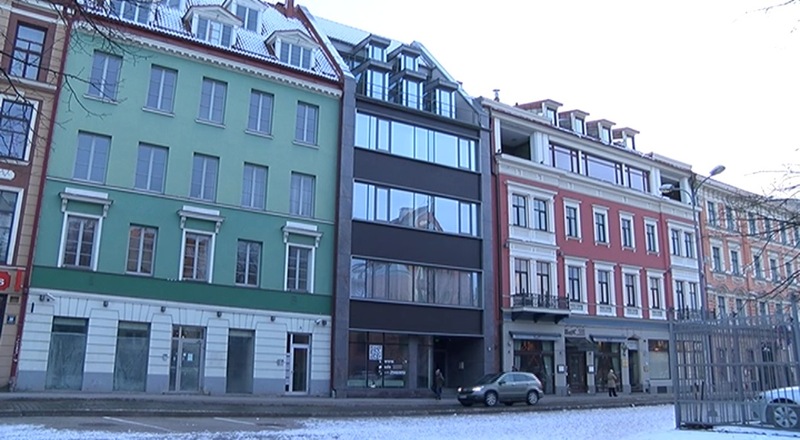 Last year, Vadim Zingman, Deputy General Director for Customer Service and a Member of the Management Board of Aeroflot, the Russian state-controlled airline, bought half of an apart-ment in Rīga, at Teātra street, for 390,000 euros, data from the Land Register indicates. He also became the holder of a Latvian residence permit. In August, The Russian state-owned RT televi-sion station named Zingman among the people with whom the Russian Prime Minister and Transport Minister had discussed a possible response to the EU sanctions in aviation. 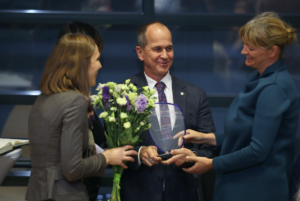 Re:Baltica’s questions to the com-pany’s PR desk remained unanswered. his contribution to the presidential election campaign of Dmitri Medvedev and is an adviser to the President’s administration, his company’s web page claims. When contacted by telephone, Orlov denied that he’s been issued a Latvian residence permit, but not the fact that he’d purchased a property. “I won’t provide answers to any questions at all,” he said. No one answered the door at his Riga apartment when Re:Baltica visited. Subsequent emails remained unanswered. The Land registry data entries match his personal data. Orlov’s writings contain the theses, that the Eurasian Union, Putin’s envisaged counterweight to the EU, shouldn’t limit itself to the former USSR, but should also include Finland, Hungary, the Czech Republic, Mongolia, Vietnam, Bulgaria, Cuba and Venezuela. Maria Khayard, the wife of Maxim Nogotkov, founder of Svjaznoi Group (one of the largest mobile telephone retailers and a bank in Russia), purchased a house for half a million euros in Jūrmala, from SIA Millenium Investments. In 2012, Nogotkov was included in Forbes’ list of global billionaires. In the same year, he was a confidant of Mikhail Prokhorov, an opposition can-didate in Russia’s presidential elections. Nogotkov also created an activist platform called Yopo-lis. In 2014, he lost control of the Svjaznoi Group, apparently for business reasons. 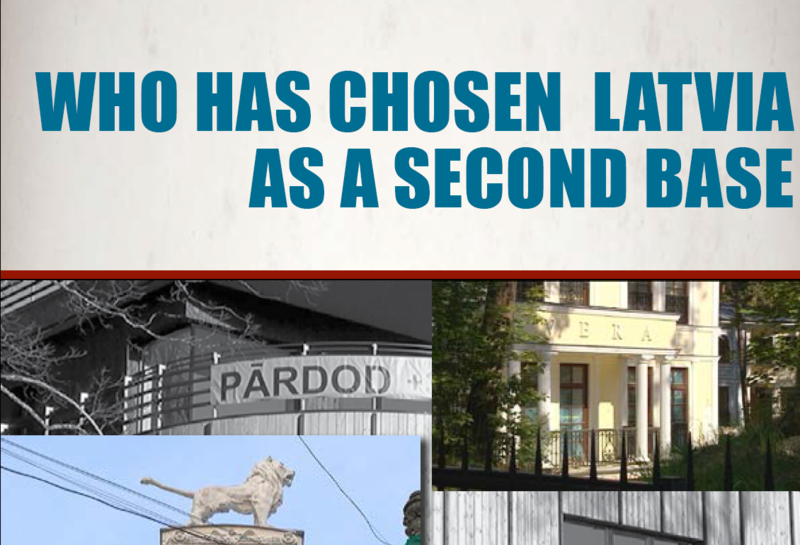 Last year, a number of high ranking employees in the group purchased properties in Latvia. Maria Khayard, who has a Latvian residence permit, did not wish to reply to questions. Ukrainian businessman Andrii Gubskyi, who owns the largest pharmaceutical distribution com-pany in Ukraine, Optima Farm, also purchased an apartment in Rīga at Grēcinieku street, for 325,000 euros, with his family. His brother, Bogdan Gubskyi, was the richest of the oligarchs in the so-called Bloc of Yulia Tymoshenko. In Ukraine, Gubskyi’s company gained some negative publicity when during the heat of the panic caused by bird flu, it was revealed that it received the sole import licence for Tamiflu, and retailed it for 600 Ukrainian hryvnias, though it had been pur-chased for 250. The Gubskyi family got residence permits in Latvia. Vladimir Shemyakin – a former member of the Russian Duma with Putin’s party United Russia, who up until recently was first deputy general director of Gazprom-Media Holding”, bought a lux-urious property in Jūrmala, at Bulduru prospekts, already in 2011 from the son of the disgraced Parex Banka’s ex-owner Valery Kargin. The Delfi.lv website reported that the transaction, worth 1.7 million euros, was the fifth largest in the Latvian real estate market that year. Another of the Parex banka ex-owner’s family projects – the Transport and Telecommunication Institute (TSI), also came under the control of the Shemyakin family. According to data from Latvia’s Register of Enterprises, TSI is controlled by JSC Potok, where Shemyakin’s wife Svetlana and one of their children, Nikita, are on the board. They both are on the board of TSI, too. As both persons have Latvian social security numbers, it is safe to assume that they have been issued residence permits. Re:Baltica was unable to find out whether Vladi-mir Shemyakin has one as well. Both Shemyakins did not reply to Re:Baltica’s questions. Until December 2014, Shemyakin was still an influential person in Gazprom Media Holding – the largest Russian media holding company affiliated with Gazprombank, where he was both the Deputy Director-General, and CEO of one of the companies, Gazprom Media, which is the sec-ond largest advertising retailer in Russia’s TV market. The Russian publication, Vedomosti, reported that since December, Shemyakin has been one of the leading people at Vi, Russia’s largest TV ads sales house. The former Vice-Governor of Irkutsk and now a professional investor (Region Group, Nova Capital) who is also on the board of the Swedish owned RusForest company operating in the timber industry in Eastern Siberia, has also purchased an apartment in old Riga. “It’s true, I bought an apartment in Rīga last year, that’s no secret, but it’s not connected with any events taking place in Russia or Ukraine. It’ a dream I’ve had for a long time. The city is very interesting and I just wanted a little nest there,” he explained. “Plus there is a good corporate tax system for business in Latvia, and I’ll consider whether I should transfer part of my business operations there. I’m not thinking about living in Latvia permanently, it’s more a summer home thing. I will seek a residence permit though, as it’s useful for travelling freely around Europe”.